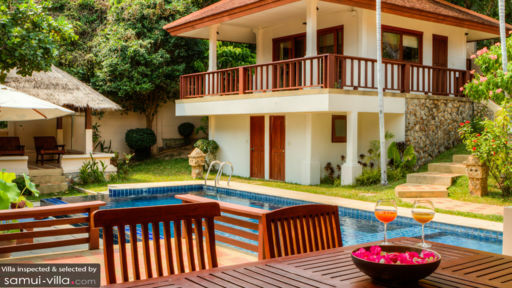 Villa Sapparos is nestled away in a serene spot within the grounds of an exclusive gated estate. The villa’s prime hilltop location offers a tranquil setting, and invites a steady stream of balmy sea breeze into its compounds. Four well-appointed bedrooms are housed in a separate building away from the main living areas. The master bedroom, containing an indoor bathroom and outdoor shower, stands apart from the other rooms within the compound. The remaining two bedrooms are housed within a single building. One contains a double bed, while the other offers twin beds. A private veranda, overlooking the scenic grounds of the villa, extends out from each of these rooms. While the last bedroom offers its own privacy for who want to have their own space. The picturesque garden is home to an outdoor sala, pool deck and a diversity of eye-catching blooms. A sparkling pool takes center stage, flanked by sun loungers and umbrellas. Nature lovers, pool fanatics and sun seekers will enjoy lounging about in this luscious setting, fringed with flowers and foliage. Vacation makers keen on keeping up with their fitness regime will enjoy working up a sweat in the shared tennis court, while film buffs will want to catch up on their favourite shows in the inviting sala pavilion. The sight of cosy interiors decked in neutral, earthy hues and tiled flooring greets holidaymakers when they step into the living area. Connected to the dining area and kitchen, this spacious living space boasts an open plan design and overlooks the glistening pool. When it comes to enjoying a feast in the villa, both indoor and alfresco dining serve as attractive options. If you do not fancy culinary pursuits, let an experienced personal chef cook up a storm on your behalf. 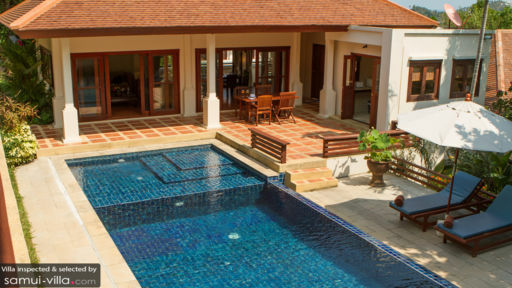 Villa Sapparos is a full service property with three on-site staff. 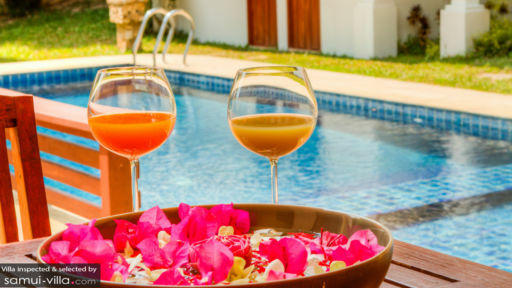 The villa offers housekeeping services, security services, airport transfers and a daily breakfast service. Personal chef services and professional child minding services are available at additional cost. The sweeping coasts of Choeng Mon beach are a short walk away from the villa, while a ten minutes’ drive will bring travellers to bustling Chaweng beach and charming Bophut Fisherman’s Village. Holidaymakers will enjoy a fun-filled day at these two popular travel spots, for a plethora of fascinating shops and restaurants await their exploration.